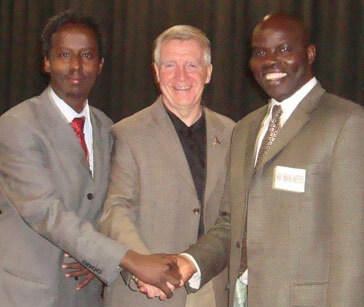 On Sunday, May 10, 2009, I was privileged to attend the town hall meeting in Edmonton, Alberta, Canada, organized by the Free Makhtal-Working Coalition. This coalition is comprised of Canadians, of Ethiopian and Somali backgrounds, who are concerned about the imprisonment of Bashir Makhtal in Ethiopia. Makhtal is a Canadian citizen, originally from the Ogaden region of Ethiopia, who was illegally detained by the Kenyan government in 2006 and then transferred to an Ethiopian military prison where he has been held for two years. He was never given any legal protections until earlier this year when outside pressure from his family, this coalition and ultimately, the Canadian government, succeeded in convincing the Ethiopian government to give him a court hearing; however, he still remains in custody. Nearly 500 Ethiopians and Somalis came from all over Canada to show their support for Bashir Makhtal’s release and because of their great concern about stopping the genocide and human rights crimes going on in the Ogaden, Ethiopia and Somalia that was affecting so many of their people. I had come to speak about genocide, crimes against humanity and the plight of our political prisoners in Ethiopia, something central to our mission in the Solidarity Movement for a New Ethiopia, but I was honored to meet so many new and wonderful people with whom I had so much in common. I have often remarked how the tragedy of the Anuak people has forced my life to go in a direction I would have never chosen, but with the pain, I have found great joy in meeting so many new sisters and brothers from all over Ethiopia and the Horn of Africa. Mr. Yassim Kassim, the moderator of the meeting, is one of them. I met him first three four years in Atlanta and he has become not only an esteemed colleague, a wise advisor and a member of the SMNE Executive Steering Committee, but a good friend. Before the meeting, he took me to meet his beautiful wife and very well-behaved young boys, ages six and nine. As I was playing with his six year old, I asked him what he knew about Ethiopia. He told me that Ethiopia is where they came from, but that the government was very bad and was killing and starving the people. He said he felt very lucky that he and his family were here in Canada where they had enough food to eat. I was touched by his comments and the fact that he was both so well-informed and caring about what was happening in Ethiopia. I asked him how he thought it could be solved? He said that his dad says to talk about it and to help others to keep talking about it. He then told me how his dad was on the phone all the time and I told him I knew how that was; however, he thought his dad might be worse than I, but I told him, “Maybe not.” It was obvious to me that even this young boy knew how much was required of those who cared about this struggle—like his own dad. The meeting was a great success. I was highly impressed with the speakers, the well-organized manner in which the conference was run, the responsiveness of the audience, the support from elected officials and the unanimity of support of attendees for the three resolutions that were later passed during the meeting. The overall intent of those resolutions was to mobilize concerned Canadians to lobby the members of the Canadian Parliament for Makhtal’s release and to establish enforceable policies that would link Canadian financial aid to Ethiopia with their compliance in meeting acceptable human rights standards for all Ethiopians. “We cannot do it alone and must work together with other Ethiopians”! As I listened to other speakers, I learned that Mr. Bashir Makhtal was “guilty by association” through his grandfather, a former prominent politician in the Ogaden region who had strongly advocated for separation from Ethiopia, but his grandson, Mr. Makhtal, has nothing to do with this. Guilt by association continues under this Meles-controlled system of injustice in Ethiopia, something not even done by Mengistu. During Mengistu’s brutal regime, Meles Zenawi was running a terrorist organization, the TPLF, to overthrow the government, but even though Meles’ father, mother and other relatives were living in Ethiopia at the time, they were never arrested like Makhtal, family members of Ginbot-7, the OLF and many others. I also learned how hard the Free-Makhtal Working Coalition members and other Ogadenis have worked to secure Mr. Makhtal’s freedom. As a result of their efforts, they have found advocates within the Canadian government, among them were the Honourable Laurie Hawn from Edmonton, a speaker at the meeting, and the Honourable John Baird from Ottawa, who sent an open letter to be read at the meeting. Baird told them that as a result of their actions, Makhtal’s case had been moved from a military court to a civilian court. Additionally, because of their work, the Canadian Minister of Foreign Affairs had met personally with the Ethiopian Minister of Foreign Affairs, Seyoum Mesfin, who had flown from Addis Ababa to Ottawa last week. Reportedly, Mesfin assured the Canadian Minister that justice would be carried out and that Mr. Makhtal would soon be released. Another speaker was an Ogadeni professor Hussein Warsame, from the University of Calgary. He tried to tell the Ogadeni and the Somali to reach out to the average Canadian people to raise awareness of the issues and to engage them in this struggle. He encouraged them to also become involved in all aspects of Canadian politics—such as voting, contacting representatives, writing letters and attending meetings—as it is the only way they can be heard and win a victory. I was very impressed with this man and I would highly recommend him as someone who should be invited to speak at an Ethiopian forum or meeting about how we need to reach out and collaborate with others in working for human rights. When I began my talk, I greeted the audience first in the Ogadeni language, then in the Muslim way and finally with the traditional Ethiopian greeting, for we all are a mixture of identities at the same time. I will only summarize parts of my talk. I began by explaining why I postponed a trip to Washington D.C. and drove six hours, one way, from Saskatoon to Edmonton, to join them for this meeting. The reason? Because if today we do not speak out for this man—Bashir Makhtal—tomorrow, it will be somebody else and the next day, it will be you or me. This was one man, but he stood as a representative for thousands of other political prisoners, many of whom had no one else speaking up for them or if they did, they were unknown to other groups. I told them of the case of Birtukan Mideksa, someone that many of them might not know. I explained that she was also a prisoner of conscience and had become a threat because she was the leader of the Unity and Democratic Justice (UDJ) party. I told them that she was a strong and principled Ethiopian politician, a mother of a four-year-old and a woman who is now in solitary confinement, serving a life sentence for simply refusing to lie for this regime. I then brought up Teddy Afro, another person they may not know, but explained that Teddy was a great Ethiopian musician who was in jail for singing songs that encouraged Ethiopians to love and embrace each other—a threatening message to this regime who survived through fomenting ethnic, regional, political and religious hatred. Their efforts have led us to separate rooms where we are all crying out against the same injustices towards our people. In this room today, we have people who want to free Makhtal, but tomorrow in other rooms, there are people wanting to free Birtukan or Teddy Afro. It does not end there for there are rooms wanting freedom for an Oromo, an Afar, someone from Benishangul-Gumuz, from Tigray, an Amhara a Southerner, someone from Harere or someone from another place in Ethiopia or Somalia, but these rooms have doors and they need to be opened to each other. We need to work together, not necessarily as one organization, but at least in collaboration with each other. The Free Makhtal Working Coalition has now asked the Solidarity Movement for a New Ethiopia (SMNE) to become part of their coalition. We have agreed for we share common goals and ideals such as putting humanity before ethnicity and that there will be no freedom and justice for me until there is freedom and justice for all. In the world, many portray Africans as people who love to kill each other, but this is really not true because if Africans did not like peace, justice, freedom, equality and opportunity you and I would not be in this room or in the western world. We have come to this free country exactly because we desire peace, justice, freedom, equality and opportunity or we would not have endured so much hardship to run from our homes to a new culture, a new language and a new people. If we Africans did not seek such a free society for ourselves, we Ethiopians and Somalis would have remained in Africa. This exodus will continue until there is not so much to run from, but for that to happen, some drastic changes must occur. One of those changes must be to eliminate our “clan and tribal mentality” that prevents us from moving ahead. We need a new more embracing worldview that will free us to become “a clan of humanity” where we no longer are known for killing each other, but for putting humanity before ethnicity. Remember, when we are born, we are first of all “human!” It is our strongest distinction and our greatest connection to others. It creates the foundation of caring, “humane” and healthy societies—something we yearn for, but do not now have. Instead, right now, Ethiopians are acting like wounded wild animals, trusting no one because of the injustice and fear of more injustice. This regime thrives on hatred, but fire cannot be put out with more fire, but only with the cooling water of love, without which our destruction will continue. EPRDF government is like a parent who refuses to take care of its own children and instead, abuses and neglects them, failing in their responsibility. In their vulnerability, the people have sought protection by taking refuge in groups such as clans, tribes or in their identities as Muslims or Christians, but these identities should not dehumanize other people, making us see them as “less human” and “less deserving” of life, liberty and opportunity. Meles wants us to divide by every category, but the missing ingredient that will unravel this regime is putting humanity before ethnicity, skin-color, gender, religion, viewpoint, educational level, language or anything else. Only if we can do this, will our people remain in Africa. Only then, will we have a bigger destiny ahead of us than what we can ask or imagine. After the meeting finished, we all went to an Ogadeni restaurant, which is owned by a woman from Harere who spoke nine Ethiopian languages—Amharic, Oromo, Somali, Tigrayan and five others. The way she treated all of us showed how much she cared about all Ethiopians. Only someone who cared deeply about others beyond her own group would take the time to learn the language of so many others. She symbolized the gardener of the garden of Ethiopia by the way she embraced the diversity around her. We all reflected on this comment as we could see how it symbolized our hope for a future Horn of Africa that could be a blend of complementary parts that would make up a satisfying whole. We could understand how by coming together around freeing Makhtal, it had made us empathize with the plight of other prisoners, like Birtukan or Teddy Afro, bringing us all closer to others who were seeking the same justice in Ethiopia and in the Horn of Africa. The environment we shared over our meal was very good. We talked as people, not limited by clan or tribe. People wanted to know about Gambella and I shared with them. It was a wonderful gathering and at the end of the supper, we were inspired to work together all the harder in this shared struggle of ours. The next morning, as the sun rose, I drove the six hours back to Saskatchewan, thinking deeply about the weekend and the future. One assignment was finished, but I wondered how many more lay ahead? I admitted that only God would know. I was alone in the car and my only companion became the music of Teddy Afro as he beautifully sang about an Ethiopia where nothing should divide us. He talked about loving one another and how Muslims and Christians in the past had not been divided by hate, but only by the sand between church and mosque, even able to hear the worship of each other because we were so close. His vision for Ethiopia was also mine and was the reason why I had taken on this journey to Edmonton. It made me hold on more tightly to the steering wheel as his words gave me hope that the God who created and loves Ethiopians and Somalis, is a God that would never abandon them. Even in this flat land I was passing on the highway, far away from my mother country, I could feel the love of God for the people of the Horn of Africa and I could see hope for our future just by looking out my windshield and seeing the hanging clouds, full of the promise of rain that would bring new life to the barren fields. My own presence disappeared into those clouds, knowing that God created us as He had created those clouds. God’s abundant love for humanity was visible everywhere I looked, urging a response. As I continued to listen to Teddy’s music, his message was so emotionally powerful that I felt near to tears as he ended his song crying out, “Mama Ethiopia,” “Mama Ethiopia.” The EPRDF are so afraid of this message of reaching out in love across all lines of division that they put Teddy behind bars. But, his words and ideas cannot be jailed with his physical body, but are moving out, thousands of miles away from that cell to my car on a lonely highway. Those words were inspiring me to do all I can in this struggle—a struggle to not just free Makhtal, or Birtukan or Teddy Afro, but a struggle to free thousands of prisoners—not only in prisons, jails and detention centers—but an entire country held captive by this regime. As he ended, I felt hope rising up that one day Ethiopia and the whole Horn of Africa will be such a place where no one is afraid of being killed for one’s ethnicity, a place where one can sing songs for justice without being put in jail and a place where millions of people do not needlessly die of hunger and disease. I thought about the many wonderful people I met this weekend who were my fellow countrymen and women as well as my co-workers in this struggle. But they were much more than that; they were my fellow human beings. I was overwhelmed with thinking about what we could accomplish together for those back home. I am a citizen of Canada by choice, but I am a citizen of the human race because of Almighty God’s gift to me—the same gift He has given to each of you. Let us recognize this common gift in each other and use it to build a better society in the Horn of Africa. The best we can do here on this earth is to live out God’s purposes for our lives and follow His example of loving others first, just as He has done for us. What a world that would be! Let each of us report for duty. What more could we ask for in our lives than this?